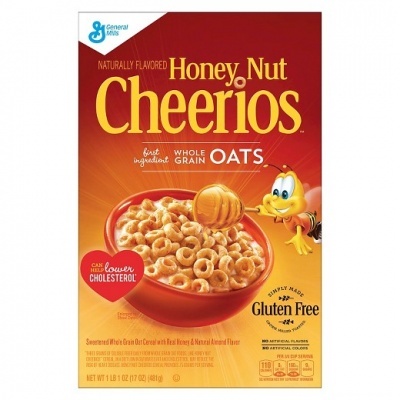 Enjoy a delicious breakfast every morning with this Honey Nut Cheerios Cereal. This cereal is made with sweetened oats and real honey with natural almond flavoring. Honey Nut cereal is made with whole grain as the first ingredient, and it contains 14 grams of whole grain per serving to give you one quarter of the daily recommended amount. A whole grain food is made by using all three parts of the grain, and all General Mills Big G cereals contain more whole grain than any other single ingredient. 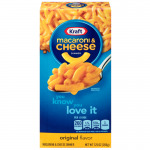 This cereal is low in saturated fat and cholesterol so it may reduce the risk of heart disease. Whole Grain Oats, Sugar, Oat Bran, Modified Corn Starch, Honey, Brown Sugar Syrup, Salt, Tripotassium Phosphate, Canola And/Or Rice Bran Oil, Natural Almond Flavor. Vitamin E (Mixed Tocopherols) Added to Preserve Freshness. Vitamins And Minerals: Calcium Carbonate, Zinc And Iron (Mineral Nutrients), Vitamin C (Sodium Ascorbate), A B Vitamin (Niacinamide), Vitamin B6 (Pyridoxine Hydrochloride), Vitamin B2 (Riboflavin), Vitamin B1 (Thiamin Mononitrate), Vitamin A (Palmitate), A B Vitamin (Folic Acid), Vitamin B12, Vitamin D3. Contains Almond; May Contain Wheat Ingredients. I found I couldn't buy Honey Nut Cheerios in London, why, I don't know. Now I know where to get them & I can enjoy a great cereal. Package was in perfect condition & the product was fresh. I love the cereals and I am so happy I managed to find them in the store. Items arrived in perfect conditions, many thanks!